Latin for 'fat or fattened', referring to the fruit. Mostly found as a small cultivated tree with deeply lobed, alternately placed, large leaves, often placed at the end of the branches only. The stipules are rather large. Fruits are growing along the branches and become about football size and shape, yellowish, with small or without spines, i.e. more or less smooth surface when mature. Most trees belong to the seedles cultivar. The exact origin of breadfruit is uncertain. The centre of genetic diversity extends from Indonesia to Papua New Guinea. In a broad sense, it is a native of the Pacific and tropical Asia. It has long been an important staple food in Polynesia. Breadfruit is now widely distributed throughout the humid tropics. Indonesia: sukun (seedless); kelur, timbul (seeded). Malaysia: sukun (seedless), kelor (seeded). Papua New Guinea: kapiak (Pidgin). 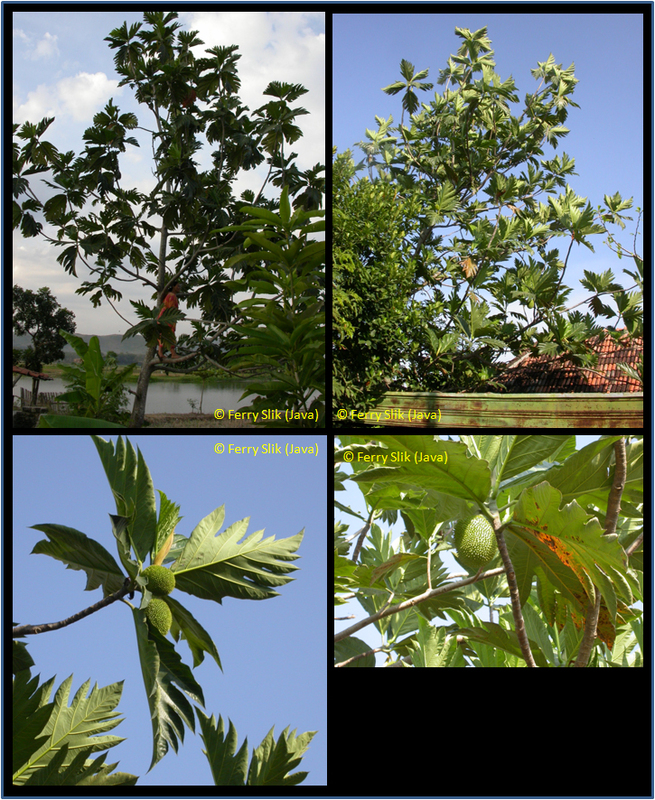 Philippines: rimas (seedless), kamansi (seeded). Thailand: sa-ke (seedless), khanun-sampalor (central).